Last weekend I presented a "trunk show" to the Front Range Modern Quilt Guild. Recently, a guild friend had "outed" me to the leadership when she came over and I showed her the 40+ quilts I had in my home. It's unusual for someone to have so many quilts in their possession, especially within a "modern" guild which is generally made up of members who are still in stages of mothering young children as well as full time work. I really didn't mind sharing my work with the guild, it was kind of them to recognize my talents/passion. One thing I addressed in the presentation was the question, "How do I get so much done?" I honestly didn't think my level of productivity was unusual until a guild member asked me a few years ago, "Do you ever sleep?" I have just been pursuing a hobby I really enjoy and wasn't comparing my number of finishes with anyone else's. Just this week, on instagram, a person commented on one of my projects, "I am jealous of all your time [sad face emoticon.]" I will admit this comment got under my skin a little but I know I shouldn't take it personally. I don't feel like I have more time than anyone else, but I know my life circumstances and priorities are very different from everyone else too. I have a very supportive husband who watches the children a lot when he's not working. He really enjoys being a dad. Once, when we lived in Massachusetts, he brought the kids to the Museum of Science on his day off and I made a very challenging bag all in one day. I have been on three retreats within the past year, thanks to his willingness to shoulder single parenting for a few weekends. On a regular basis, he gladly gives me a break from their demands when I need or want to attend to a sewing project. I am a stay at home mom and I can fit in sewing time fairly frequently during the day. When I just had my son, he was a champion napper and didn't give up taking two naps until he was about eighteen months. He didn't stop napping altogether until he was way past the age of three. Once my daughter was born, my sewing slowed down considerably but eventually I got them to take naps at the same time. Yes, sometimes I sew when my children are awake. GASP! Go ahead and call children's services on me if you'd like. I think it's funny when people insist they only do anything for themselves when their kids are asleep, as if taking a few minutes for you, throughout the day is just not acceptable. But I will admit that sometimes I have been selfish and maybe my obsession with a project has taken priority when my kids needed me more- that's something I try to pay attention to and avoid. I really do feel strongly that kids don't need to feel like they are their parents whole universe, it's healthy for them to see you doing something for you and to know that they don't reign over the parents lives 100% of the time 24/7. I can sew when my kids are awake sometimes because my sewing areas have been in close proximity to their activities. I sewed in my kitchen for seven years. This picture shows that area in our MA apartment. (The sink and countertop are to the left, the "living room area" are to the right- it was cramped, but we made it work!). Right now, I am blessed to have a sewing room that is adjacent to the toy/tv/family room, where they play quite a lot. I also allow my kids to come in my sewing room (second picture) when I am in there. I usually gravitate towards projects that are comfortable within my skill level. It's true that I like an achievable challenge but there are many techniques I know I don't have the patience or time for. I don't make queen sized quilts out of tiny paper pieced blocks. Intricate needle turn applique holds no interest for me. 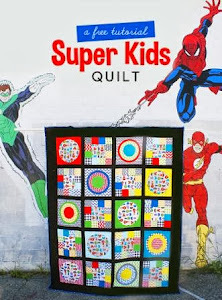 It's true that I make super sized quilts but big doesn't always equal hard. I sew a lot because I LOVE it! It's my favorite and only hobby. I used to read tons of books and had a passion for journaling. Now I am lucky if I read a dozen books a year and the journaling has slowed down considerably. Perhaps my priorities are sometimes a little out of balance: we eat leftovers frequently, my house is not as clean as it should be, and I often favor sewing over exercise. I have had a few successes with being published but I am really not in this game to make money or make a name for myself. I love how diverse sewing and quilting are: there's always new patterns and fabrics to try and use and new skills to be acquired. I love giving my creations to friends and family and I feel good that I have also created heirlooms for my children. Lots of people lose their motivation (aka "sew-jo") and give up on it all for a while, that never happens to me, although frustrations do occur. I wouldn't do it so much if it weren't so fulfilling and satisfying. It's a cliche, but unlike housework (for example), sewn items "stays done"- completion is achievable! Thanks for reading if you've gotten this far. I hope it's okay to write down my thoughts now and then instead of just posting project after project. I have been thinking about ways to make this blog more personal and personable instead of just being a record of my WIP's and finishes. To end, here's a quote I love from a beloved Mormon leader within my church. It sums up exactly how I feel about my hobby. "As you take the normal opportunities of your daily live and create something of beauty and helpfulness, you improve not only the world around you but also the world within you." Dieter Uchtdorf. Sometimes the thought of going to Target on a Saturday morning for birthday presents is enough motivation one needs to make handmade aprons for the birthday kids instead. I stayed up way too late on Friday night but it was worth it. The family apparently likes to bake/cook together and the mom mentioned loving the idea of having kid-sized aprons for her children. The aprons have pockets and are made from an easy "Sewing for Dummies" pattern. We used the money we saved to hire a babysitter Saturday evening and my husband and I went on a date! Win, win, win. A while ago I approached my friend Sarah about doing a private mini quilt swap with each other. She's kept in touch since moving away from the Boston area and I've really enjoyed our friendship. We met at the BMQG about 3 years ago and I thought it would be meaningful to have something made from a good friend to hang in my sewing room. My walls are SO bare in there and it's shameful! I felt nervous that this would be good because it wasn't as complicated/time intensive as a lot of the minis you see for swaps on blogs and IG. I also doubted my choice of using the color brown, as that is not a very rarely a popular color choice among modern quilters. But I felt like if I didn't have a few very dark fabrics, the design wouldn't "pop" and the whole thing might look washed out. I also made some extras for Sarah with some yellow fabrics I had in my stash; a large open wide zip pouch and a Sew Together Bag. I think I've made about five Sew Together bags and this last one probably gave me the hardest time of all! Imagine my shock when she received two Sew Together Bags from friends prior to our swap deadline, after I had made this especially for her! She is so loved, she had three different friends willing to make one of the most difficult and time intensive zip bags for her - did I mention she now has three?! Isn't it gorgeous?! She really nailed it. I love the choice of fabrics and the color scheme. I love the design. 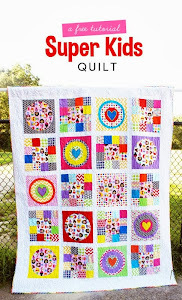 (This quilt is one of my all time favorites from the blogosphere). I wanted to share close ups of the amazing free motion quilting. This girl has skills! Sarah also generously provided lots of extras - including clothing for the baby and bubble wands and candy for my kids. That night, after I had received her package, I literally had a dream that we got in an argument because she was upset that her package to me was better than what I had sent to her! I emailed her about it and we had a good laugh. But seriously, she was extremely generous. Linking up with this month's Le Challenge for the word, "passion." There's lots of ways this post and these sewn items relate to passion. It was passion for this craft that has led me to include guild participation as a priority in my busy life. Meeting people like Sarah has been the best part of that decision- it really is all about the connections you make with people and it's more than fun to share enthusiasm for the same hobby together. I also have to say that my appreciation and enthusiasm for different designer's fabrics keeps me hooked too. If I only had the fabric choices that traditional shops catered to, I really doubt I would be sewing much at all. I have known to go "fangirl" for specific designers and that is so un-cool, but oh well. People like Anna Maria Horner, Lizzy House, Amy Butler, Ann Kelle, and Joel Dewberry have really changed the fabric world and I love it! It's my turn to host book club again. Our small group picked the classic, "To Kill a Mockingbird." I will admit that I was less than thrilled with the choice because I have read it numerous times. If you grow up in New England, you will read "Adventures of Huckleberry Finn," and Mockingbird ad nauseum. At least that was my experience. But despite my trepidation, reading it again was nice and I really enjoyed it. It's a classic I can actually understand. This mommy brain can't handle Chaucer and Dante right now. Anyway, I went a little overboard with the door prizes, I am hosting our group tonight. You see, I have a lot of bird fabrics and pulling from my stash was easy. I am also trying to be more generous and share what I make. I tried to do simple projects besides zip pouches and I enjoyed the diversity of making so many different items. Then I made a hoop organizer (you hang this on the wall and it can be a pretty way to store sewing supplies, writing utensils, etc.) I had never made one before but it was quick and easy, it only took me an hour. Here's my son modeling the apron I made, isn't he so cute? What a good sport. Something tells me he won't be so willing to do this for too much longer. Finally, a pillowcase out of some fabric I've had for ages. Several weeks ago, at an FRQG meeting, I made a resolution to use up 50 yards of stash fabric by the year's end. I haven't done a good job of keeping track of this, but I am going to start documenting this on my blog now. I will end each post that documents finished projects from stash fabrics with a total. Within the next week, I will go through my most recent finishes blog posts to update what I've accomplished since that meeting, which will also allow me to keep a running tally. Wish me luck!